This has been a very interesting season. We knew that it would be, given that it’s an off year and off seasons are usually marked by change – and 2018 has seen lots. As a matter of fact, we’re looking at a nearly wholesale revamping on the men’s side. I can’t remember this great a reboot since BALCO laid waste to the landscape back just after the turn of the century. This time however, it’s not so much about people leaving the sport as we’re looking at a serious youth movement taking place. Possibly the largest of the professional era of the sport. Sprints, hurdles, jumps, distances, everywhere you look young men and women (20 and under) are rising up to become serious contenders for World and Olympic medals in the next two years. Several have already made their mark and called an end to what has been a long season for them. Michael Norman (43.61), Rai Benjamin (47.02h), Aleia Hobbs (10.90), and Sydney McLaughlin (52.75h) are just a few of the “kids” that figure to feature prominently next year that have signed professional contracts and shut down to begin preparations for the upcoming championship cycle. As I write this, Lyles leads the world in both short sprints (9.88/19.65). While he has the fastest time of the year, a poor start leaves him vulnerable in the 100. It’s the deuce where he’s nearly unbeatable as a blazing finish finds him running away from the competition as he shifts into Noahdrive coming off the turn! He’s also become quite the showman. Wearing “The Incredibles” socks, doing victory dances, and online giveaways! I think he’s great for the sport, not to mention he’s the prohibitive favorite for the Doha 200 crown. With a handful of Diamond League races on the docket, and Lyles leading the 200, we could see him once out twice more before this seasons end. Stay tuned! Shelby is a tad older than most of the athletes on this list at 25 years old. But this year she’s blossomed and has become one of my favorite distance runners, as her blazing kick has laid waste to field after field. She’s set the American Record in the 5000 at 14:34.45, and become #4 all time American in the 1500 at 3:57.34. Every race unleashing a kick that finds her looking like a sprinter anchoring a 4×4! Her finish is even deadlier than Jenny Simpson’s – and get kick took her to World gold in 2011. I’m dying to see what Shelby does in Doha. Hoping to see her again in diamond League competition. 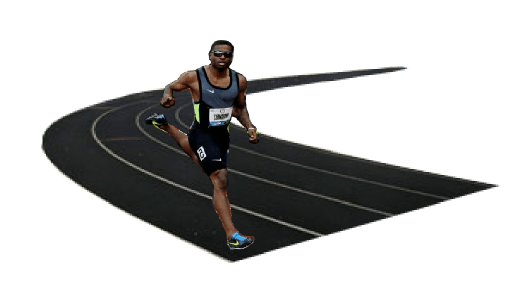 Rai Benjamin made news when he tied Edwin Moses to become #2 all time in the 400 hurdles – stealing the thunder from Samba who’d been having an outstanding season. Samba proved to be lightning however, striking his own #2 blow by becoming only the second man in history to run under 47sec with an outstanding 46.98! Setting up one of the most anticipated head to head competitions in the sports history. To prove he’s no fluke, Samba had run 7 races under 48sec – that’s a Moses type season! And he’s run a PR 44.62 in the open 400. Like Lyles he leads the Diamond League in his event, so we should see him again before seasons end. Should be exciting. And that much anticipated head to head south Benjamin? That will have to wait until next year. When they go at it however, expect something amazing! The women’s sprints have been dominated by the US and Jamaica since the 90’s. It’s been the rare European to come along and threaten that dominance. Christine Aaron, Irina Privalova, and most recently Daphne Schippers. This year, Ms Asher Smith has become a serious threat as she’s become consistent under 11.00. Setting a PR 10.85 in winning the European title. Joining the British men as serious contenders on the world stage. Asher Smith strikes with a blazing start, and has developed a fish to hold on. I’m anticipating that she’ll run in the Diamond League finale as she’s been a top point earner this year. A high finish there will paint her as a major contender in Doha. This kid is the hottest young non African miler since Alan Webb. He’s run 3:52.28 in the mile and 3:31.18 in the 1500 and sites at #4 on the yearly lists in both events! Oh, by the way, he’s only 17 years old! In the 1500 he’s behind two Kenyans and his 25 year old brother – with a third brother also highly ranked. We’re talking about some serious family genes here. That and one serious young miler. Serious enough to win this year’s European Championships 1500. A nice prelude to a medal attempt in Doha. This kid is the baddest non African teen in history! Stay tuned for the Doha showdown. The young 20 year old quartermiler has had a serious break out season. Five races under 50sec, and undefeated until her epic race with Olympic medalist Shaunae Miler Uibo. A race that ended up being the fastest in a decade with Nasser running 49.08 to become #13 all time! Not to shabby for a 20 year old. Nasser has shown to be a savvy racer with a very strong finish. And as the Diamond League point leader in the event we should see her in the final. Something I’m looking very much to watching. The 29 foot barrier in the long jump is rarified territory. That’s why fans went nuts when Echevarria leapt 8.83m (28′ 11.5″) this summer with a barely windy 2.1mps breeze. Legally he’s gone 8.68m (28′ 5.75″) to move the 19 year old to #10 all time. Making this kid the best long jumper in a decade. The jumps are very fickle. Carl Lewis chased his legal 29 footer for a decade. So there’s no guarantee that Echevarria will get there legally. But his technique is spot on, and right now time is on his side. At the least, he’s got a good shot art racking up a nice series of medals. If he doesn’t get 29 feet, perhaps he can attempt four golds in the Olympics – a la Lewis. Not could be even more impressive. Doha could be a prelude to history! Keep your eye on this one. Many were worried about the retirement of a certain former sprinter. After watching the youngsters this year however, it’s clear that the sport is in good hands and is just fine. With so many athletes moving into the top 10 of their events this year, excitement has gotten a 10 fold jump this year. If you don’t believe me, watch the remaining Diamond League events and see for yourself. This entry was posted on Friday, August 10th, 2018 at 7:21 pm, by CHill. You can follow any responses to this entry through the RSS 2.0 feed. You can leave a response, or trackback from your own site.